Over the last few decades, special effects and technological creations generated in the name of entertainment have given rise to a ‘science-fictionality’ that brings the technologies that have been imaged and imagined by science fiction films closer to our everyday reality. Above all, it is the robot and cyborg – the former being a mechanical being endowed with artificial intelligence, and the latter a synthesis of human and machine – that have been the most iconic technological effects of science fiction cinema, and it is the robot beyond the screen that this essay focuses on. In Robots: the Quest for Living Machines (1994) Geoff Simons states that the robot dream has existed in the human mind from antiquity to the present day. Simons understands these ‘robot dreams’ as reflecting the way human beings struggle “to cope with an incomprehensible universe” (1992, p.12). From the ancient Greek legends of Pygmalion who breathed life into a statue Galatea to Dr. Victor Frankenstein who animated the flesh of human corpses with electricity to create his monster, the myths and legends that deal with the creation of artificial life are as old as human history. As Simons suggests, creation myths are not only common in most cultures, they “often have an interest in robotics” (1992, p.16). We have come a long way since the myths of Pygmalion and the Frankenstein monster. Emerging media mark a radical turning point not only in our ways of perceiving entertainment and science fiction cinema as one such form of entertainment, but life itself. My interest is what Brooks Landon calls “science fiction thinking” (2002, pp.6-7), and what Istvan Csicsery-Ronay labels “science-fictionality, a mode of response that frames and tests experiences as if they were aspects of a work of science fiction”. (2008, p.2) As Csicsery-Ronay explains: “SF has become a form of discourse that directly engages contemporary language and culture, and that has, in this moment, a generic interest in the intersections of technology, scientific theory, and social practice” (2002, p.4). I’m concerned with exploring the journey of “science fictionality” that travels between science fiction as a genre and the ‘real’ world that gives shape to it. In this essay I’m especially interested in Japanese developments in robotics, and in the close relationship this development has had with fictional robots in science fiction. Since the late C20th this artificial being – as perceived in science fiction – has exited the screen to become part of our reality. As a genre, science fiction has inspired the realization of so-called ‘entertainment robots’ since the 1990s, especially within Japan. During the mid-1990s, Tatsuzo Ishida, Sony Corporation’s robotics engineer (who had, since the 1980s, overseen the production of entertainment technologies such as Walkman, handycams, and game consoles) proposed that Sony engineer a new species of humanoid entertainment robots along the lines of C-3PO, the famous screen robot of the blockbuster science fiction film Star Wars (1977) (“Robots” 2001, n.p.). The Sony Corporation agreed, and with fellow roboticists Yoshihiro Kuroki and Shingo Tamura, development chief at Waseda University’s famed robotics lab, they began designing entertainment robots. In the 1990s, the media conglomerate was a leader in this field. In 1998 Sony announced Aibo the pet robot dog, a pet companion who played ball, recognized its owner, and performed a variety of tricks. Sony could barely meet demand for sales and on November 16, 2000 the second Aibo model went on the sale in Japan (and online) for $3200. Being one of the most advanced examples of artificial intelligence for its time, Aibo (who I was besotted with when I first saw it in action) was available worldwide via some department stores and Sony’s website. 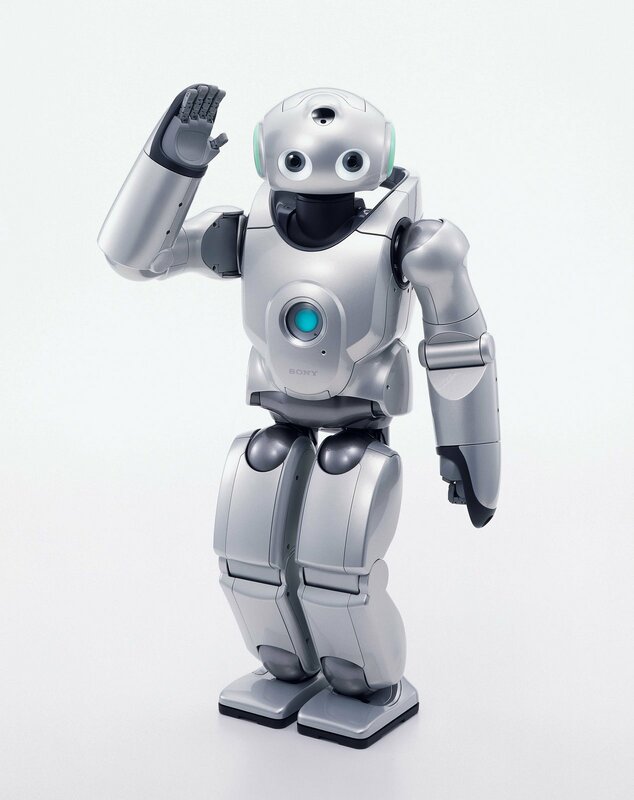 In 2000 Sony also released a small humanoid robot, which it called the SDR-3X (Sony Dream Robot), and this was soon followed by the SDR-4X. In 2004, the SDR-X4 was superseded by QRIO who had more advanced artificial intelligence programming than both the SDR series and the Aibo dog-robots. QRIO – whose name stands for ‘Quest for Curiosity’ – could listen to and follow commands, walk, fall and pick himself up. He also sang and danced to intricately programmed music, and was also capable of synchronizing its movements with those of fellow QRIO dancing robots. Unfortunately, the Japanese ‘bubble economy’ of the 1990s put an end to the production both of the Aibo and QRIO. Nevertheless, QRIO’s importance is significant in that he was emblematic of the fact that the science fiction robot had become a reality. While its pre-engineering phase was inspired by Star Wars’ C-3P0, it was the manga and anime robot Astro Boy who influenced this boy-like robot. QRIO stood at 60cm and was about the height of a small child (like Astro Boy), and he even starred in the new series of the Astro Boy cartoon (Fuji-TV) that was produced to commemorate 40-years of the anime Astro Boy. Appearing in Episode #43 titled “A Robot that Admires Humans”, QRIO starred as itself. It was the first time a real robot actually starred in a film, and to add to QRIO’s talents, it was also responsible for dubbing its own voice in the episode. (“QRIO the Robot” 2004, n.p.) An invention of advanced scientific reality migrated into the realm of science fiction and, in doing so, highlighted the slippery boundaries that separate the science fiction genre from the science fictionality of everyday life. More recently, Tomotaka Takahashi, Director and Founder of Kyoto University’s Robo-Garage and Professor at Tokyo University has continued the efforts of roboticists to give three-dimensional life to a two-dimensional science fiction character. A self-professed fan of Astro Boy and anime science fiction in general, Takahashi has created some of the world’s most mobile robots, and his series of ‘boy’ robots – Kirobo/Mirata, Robi, Evolta, Chroino, Manoi, Neon – are all clearly inspired by his idol Astro Boy. Other science fiction anime influences on Takahashi’s creations include the Magdan, Tetsujin 28GO, Gabby, and Tachikoma bring to life famous science fiction anime mecha (http://www.robo-garage.com/en/cr/index.html). The intention behind establishing the Robo-Garage laboratory was driven by a sincere desire to move away from functional robots that are programmed to perform tasks and to embrace robots that are “entertaining” so they may become more easily integrated into our daily lives. Where once we were in awe of effects that generated robots like the Transformers, the Cylons, and Terminators contained within the screen, Takahashi now asks that humans embrace these previously mythic beings as part of our society (Conversation with the author, 17/5/2009). Takahashi’s most recent venture has focused on Kirobo and his ‘twin’ Mirata – both inspired by Astro Boy. On August 4th 2013 Kirobo was launched into space from the island of Tanegashima, Japan in an unmanned rocket headed for the International Space Station (ISS). The talking robot was created as a companion to the astronaut Kochi Wakata who will arrive at the ISS in November. 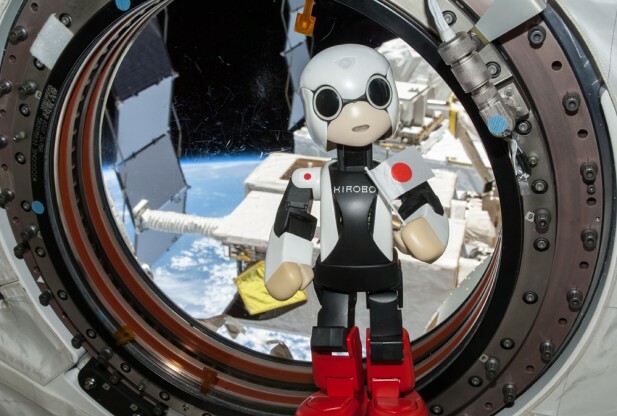 “Standing at just 34 centimeters (13.4 inches) tall and weighing about one kilogram (2.2 pounds), Kirobo is programmed to communicate in Japanese and keep records of its conversations with Wakata, who is the first Japanese astronaut to command the ISS.” (Kirobo 2013, n.p.) Takahashi explains “Kirobo will remember Mr Wakata’s face so it can recognise him when they reunite up in space… I wish for this robot to function as a mediator between a person and machine, or a person and the Internet, and sometimes even between people.” (Kirobo 2013, n.p.) Paraphrasing Neil Armstrong’s famous words when he set foot on the moon, Mirata, who will monitor Kirobo from Earth, announced at the launch “It’s one small step for me, a giant leap for robots” (Kirobo 2013, n.p.). With an app I was able to monitor Kirobo’s movements in outerspace as he travelled towards the ISS, and this action felt like a momentous one. Science fiction becomes science, and the two domains regularly blur in Japan where fictional and actual robots often share public space as if one and the same. Since the boom of robot technology in the 1990s, the Japanese urbanscape has readily adapted science fiction mise-en-scene for the enjoyment of its citizens, echoing Takahashi’s wish for the “robot to function as a mediator between a person and machine”. 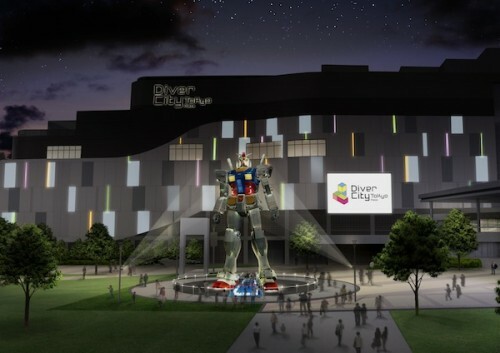 This year an 18-metre tall mecha Gundam RX-78-9 statue was placed in the Diver City Tokyo Plaza where a Gundam museum/mini-theme park opened in 2012. The most recent exhibition focused on Gundam character designer Yoshikazu Yasuhiko and, from August 1 2013, a new exhibition opened that examines the science of Gundam , “from space colonies to mobile suits, comparing it to real world achievements and exploring the future of scientific possibilities” (Lamb 2013, n.p.). In 2010 an 18-metre life size statue of Tetsujin 28-go became a permanent attraction at Wakamatsu Park in Kobe – the birthplace of his creator Mitsuteru Yokoyama. The statue was constructed to commemorate the 15th year anniversary of the Great Hanshin earthquake that hit Kobe on January 17th, 1995 killing over 6,000 people and leaving hundreds of thousands homeless. Organisers of the project stated that “Tetsujin has been built in Kobe as a symbol of the city’s revival and as a guardian from future disasters”, and at the official opening ceremony on the November 28th 2010, Mayor Tatsuo Yada officially accepted Tetsujin as a Kobe citizen. Good morning to everyone on Earth. This is Kirobo. I am the world’s first talking robot astronaut. Nice to meet you… A robot took one small step toward a brighter future for all. (Gaudin 2013, n.p.). Csicsery-Ronay, Istvan 2008, The Seven Beauties of Science Fiction, Wesleyan University Press, Middletown. Landon, Brooks 2002, Science Fiction after 1900: from the Steam Man to the Stars, Routledge, New York and London. Nakada, Gail 2003. Birthday ‘bot: Japan’s most famous superhero is back in a big way. Japan Inc. January 4. Simons, Geoff 1992, Robots: the Quest for Living Machines, Cassell, London.